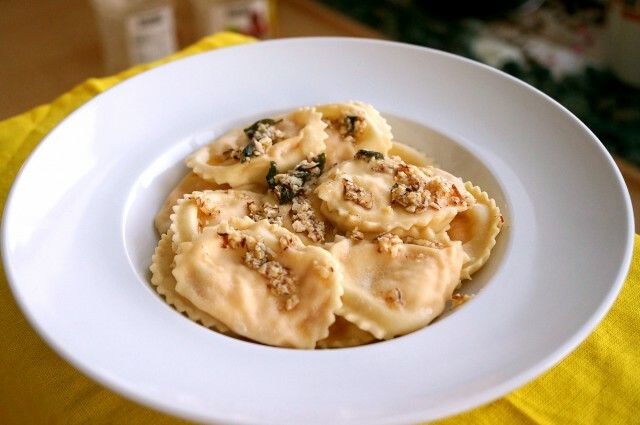 Pumpkin ravioli is a fall favorite but because you can use canned pumpkin in this recipe, you can make it all year round. For the dough recipe, check Ravioli with Meat and Chanterelle Mushroom Sauce or Ravioli with Mushroom Cream Sauce, and how to bake the pumpkin for the filling check Pumpkin Buns. By the way, if you don’t have time to make the dough from scratch, you can use wonton wrappers instead. 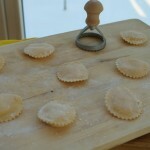 I used them in Wonton Ravioli, but of course homemade pasta does not compare to anything else. 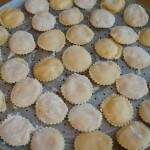 We love homemade ravioli, especially when using fall flavors and they are my daughter’s favorite! 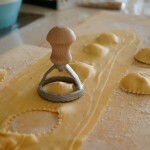 We used this ravilioli press, it was easier than some others we tried. For rolling out our pasta, we have a KitchenAid stand mixer and this pasta roller attachment is perfect. If you want something more basic, there are a lot of standalone hand pasta rollers that work great too. First, prepare the dough for ravioli. For the filling, mix in a medium bowl the pumpkin puree, finely chopped sage, lemon zest, nutmeg, salt, pepper, whipping cream and parmesan. Mix well. 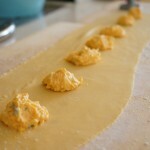 Make the ravioli by adding about 1 tsp pumpkin filling for each ravioli. Make sure to seal well, then place them on a baking sheet or cutting board sprinkled with flour. Put in a cool place. 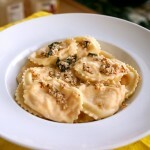 For the sauce, heat the butter with the sage leaves and nuts, and warm over medium heat about 3 minutes. Keep the sauce warm until the ravioli are prepared, then pour this sauce over the ravioli and sprinkle with grated cheese. Boil the water in a large pot, add salt and cook the ravioli portions over medium heat for about 3-4 minutes, then put them in a bowl with a lid, drizzle a little olive oil on top. 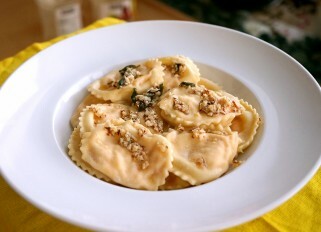 Serve with sage sauce and almonds.